All users of the KIPA website should be informed that, there is no guarantee that your supervisor has or the KI Department Officers provide to the researchers the most updated and complete information. Regulations are regularly updated and programs can change, therefore it is wise to check the original sources. Here we provide a useful list of links. KI HR central webpage (here you can find information about your employment, including code of conduct, leave of absence, termination). KI Postdoc Portal (here you can find information about rules regarding postdoctoral training). KI Staff Portal (here you can find information about rights, obligations and opportunities for employees as well as information on academic unions). KI International Staff Office (here you can find information about your stay in Sweden and at KI). KI Career Service (here you can find information about advance training offered at KI to students and researchers, including postdocs). It is very important that all postdoctoral researchers check the administrative information themselves. For example, some administrators at your department might tell you: 'you will receive a stipend of X SEK which is tax-free and this is good for you'. Please note that some information might be accessible only when navigating from within the KI intraweb. Stipend/Scholarship for maximum 2 years, if you are an expat or do not hold a Swedish PhD degree. External scholarship (your own funding). Employed under the Kollktivavtal agreement for maximum 2 years. This type of contract can be signed maximum within three years after PhD graduation. Employment with the LAS/ALVA (temporary) contract for maximum 2 years. This type of contract does not have an official time restrain to be signed. However, keep in mind that accordingly to Swedish Law, a researcher can be appointed as postdoc until 6 years after PhD graduation. In summary, you can be a postdoctoral researcher in Sweden for a total of maximum 6 years after graduation. VERY IMPORTANT!!!! 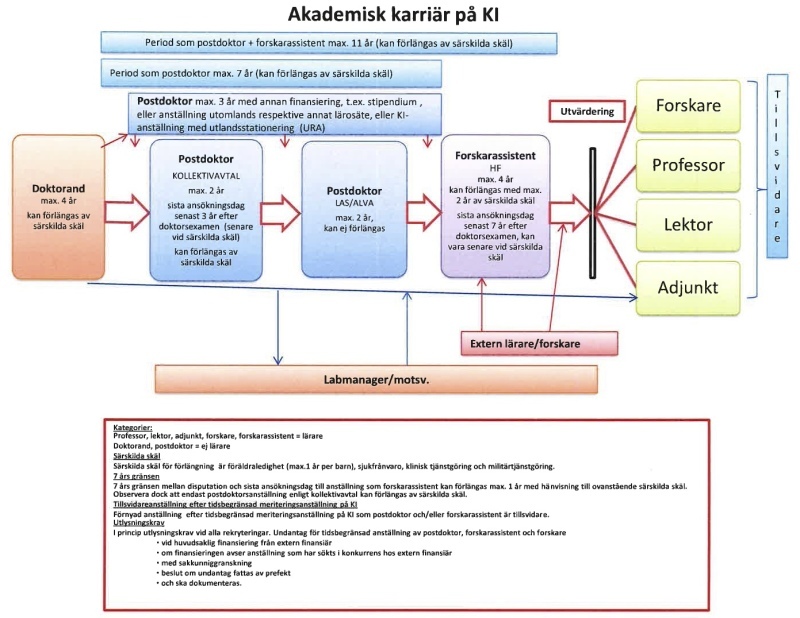 NEW ACADEMIC CAREER SYSTEM IN SWEDEN!!! The Swedish Government announced an addition to Högskoleförordningen (the Swedish Higher Education Ordinance, SFS 2017:844). Among other changes, the eligibility criteria to Biträndande Lektor (Assistant Professor) are reduced from the current seven to five years after PhD graduation. How does this affect the postdoc appointment???? A young research can work as a postdoc at KI (as employee or scholarship holder) even five years after PhD graduation. However, these researchers (especially the ones who will join KI in the future) will have to be made aware that they will not be eligible for the tenured Assistant Professorships in Sweden. KIPA’s perspective is that on one hand this will secure the current postdocs at KI that they can continue their current projects as planned before the amendment to the Higher Education Ordinance (the change is sudden and does not include a reasonable transition period for its implementation). On the other hand, it will generate a double standard between postdocs very well informed about the peculiar Swedish academic career system early on in their PhD/early postdoc training and the rest of the world. KIPA will keep advocating for a more clear and fair system. These matters take time, but positive changes can happen. This amendement come as a consequence of the Research Bill 2016/17:50, where the Swedish government did not change anything regarding postdoctoral working and training conditions but expressed a concern that a long postdoc period will prevent reaching professional stability and job security early enough in one’s life.